After the rain we've had the last few days, my yard has been too wet to get out and do any more planting or work. 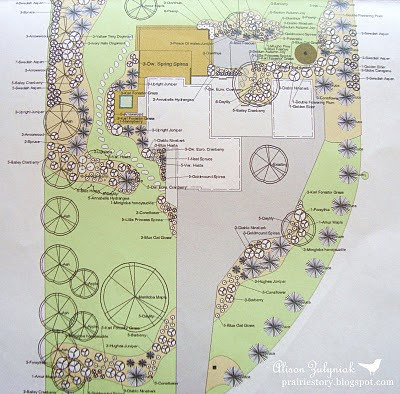 So I've been indoors studying my yard plan and assessing what to work on next. When we first moved onto this property I had the local garden centre, Shelmerdine, come out and identify all the existing trees, shrubs and plants, and subsequently draw up a master plan that I can work towards. This really helped me to understand what plants would thrive in my prairie yard, ones that deter deer and other little prairie visitors, and as well provide additional privacy and wind block. 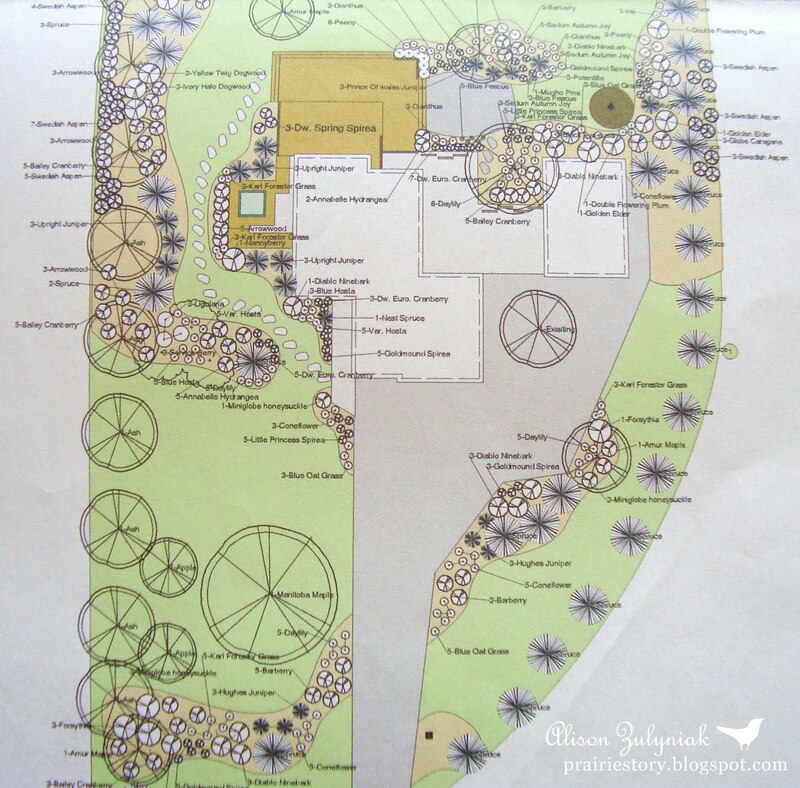 The above is roughly the front half of the yard plan, which is mostly consists of beds for additional trees, shrubs and perennials. The back half of the yard will be mostly trees, fruit and vegetable gardens. By no means do I expect to get this all done anytime soon, but every year I'll chip away at my 2.5 acres. Shelmerdine's charged a small fee to come out, consult and review the plan with me. Money WELL spent! Alison, you sound like a perfect candidate for membership with the Friends of the Assiniboine Park Conservatory. Check out our new website at www.friendsconservatory.com. We're looking for a new board member too if you are interested. A young person like you would be a welcome addition to help us attract a younger demographic to our ranks. I loved the story about the peonies and I remember them so well from your wedding. To date you are the only person who has used them that I have come across. It's nice to know the meaning behind the choice. I just got a new one this year and can't wait to see it bloom in my yard next year hopefully.